Artist, singer, reader, woodcarver, budding zoologist – Julianne in many ways is mature beyond her just-turned-12 years. 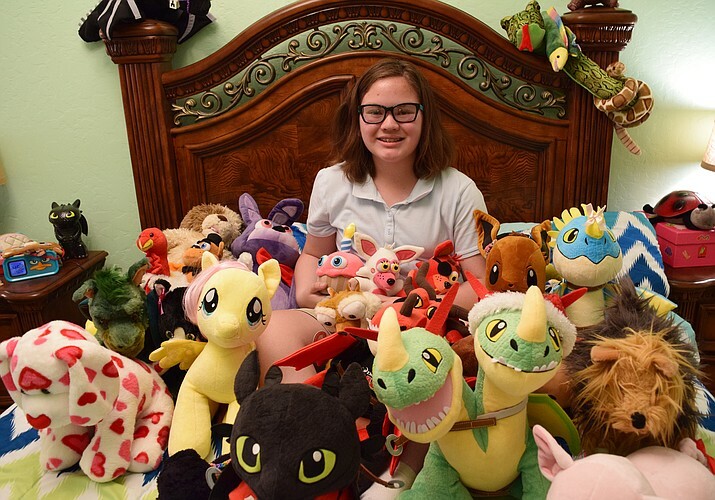 But she still loves to snuggle in bed surrounded by her many plush Build a Bear creations, from smiling dragons to the final animal her dad gave her – a white puppy covered with red heart shapes. Julianne’s idea of activities with a Big Sister involves a lot of craft making. She says her favorite hobby is art, especially sketching mythical animals and finishing her pictures with a myriad of colored markers. She already has carved a whistle and fish hooks out of wood, made a wolf head mask from a box, fashioned a bracelet, and tried some “chemistry you can eat” food crafting (eating is another favorite hobby), and would like to do much more. She would enjoy exploring the outdoors with a Big. Julianne liked viewing the Grand Canyon, but she said it hurts to see the garbage people leave in beautiful wild places. She’s a good swimmer and gladly would hit the pools and creeks with a Big, as well. If you have a creative and inquisitive mind and a few extra hours each week to give, you might be the perfect Big Sister for Julianne or another young lady. An additional way to support Littles is by providing a tax credit-eligible donation. Go ahead and call Yavapai Big Brothers Big Sisters at 928-778-5135, or visit azbigs.org to start your adventure. Bowl For Kids’ Sake 2019 Sponsorships are Available! Little Brothers show off their culinary talent! YBBBS earns 3rd consecutive 4-Star Rating by Charity Navigator! Phil Whitehead on Breaking News! Match Just Made! Debra Andrews on YBBBS makes Parade Magazine!